An East Dunbartonshire man is facing jail after driving 20 miles along busy motorways while out of his mind on a Japanese designer drug. Stirling Sheriff Court was told today (Tuesday, March 7) that Calderwood (42) appeared to be almost unconscious behind the wheel of his Vauxhall Astra and was foaming at the mouth and barely able to stand by the time police arrived to help. At about 5.30pm, a trucker on the M9 who was doing about 55 miles per hour in the inside lane watched in horror in his mirror as Calderwood’s Astra came up behind him, almost hit him, then overtook, just missing the rear of the lorry, before drifting onto the hard shoulder and back again onto the motorway. 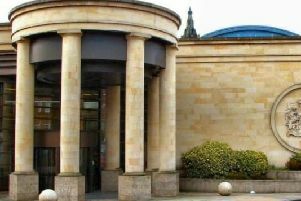 Calderwood, single and unemployed, of Townhead, Kirkintilloch, pleaded guilty to driving while unfit through drugs in the incident on May 23, 2016. Sheriff Richard McFarlane deferred sentence for four weeks for reports, disqualified Calderwood from driving in the interim, and praised the lorry driver and the other motorists, who were not named, for their actions. He told Calderwood: “The journey described significantly compromised the safety of other road users. “The lorry driver, and the other drivers, are to be commended for bringing you up to a halt. Calderwood, who could be jailed when he returns to be sentenced, laughed and joked he left court with a friend.